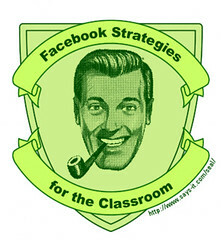 Teachers & Students & Facebook? If you’re a teacher/librarian, do you friend your students on Facebook? MySpace? twitter? flickr? Do you communicate via email? IM? Texting? Is Facebook different than other tools for some reason?Â As educators do we have the responsibility for teaching smart/safe online behavior in ALL possible contexts? Does setting up a separate account for your teacher persona solve the problems? Does your school district have a policy? Should they? Or are we trying to control what can’t be controlled?Â Will all this worry and fretting seem quaint in 5 years? (1?) Have you avoided the issue by not using Facebook and other ‘social’ tools? There are some great discussions going on around these issues on Doug Johnson’s and Dean Shareski’s blogs. Whether you have a strong opinion on the issues or not, take a few minutes to read the various points of view expressed in these posts and comments. And add your voice to the discussions!